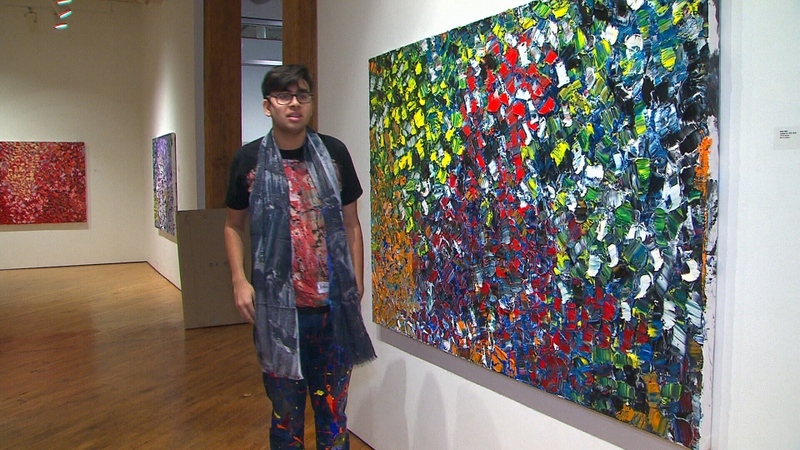 A non-verbal teenager with autism is finding a new voice through his striking artwork, which is already being sold for thousands of dollars at a Toronto gallery. Niam Jain began painting three years ago. Since then, the 15-year-old has become an emerging artist in the fields of gestural abstract art and abstract expressionism. Niam’s unique style caught the eye of the associate director of the Abbozzo Gallery in downtown Toronto. The gallery is currently showing an exhibition comprised entirely of Niam’s artwork and it appears to be a success. Of the 12 paintings on display, 11 of them have already been purchased for approximately $5,000 to $6,000 each. “Niam is an artist regardless of his limitation, which I don’t even believe is a limitation,” Rosada said. The young artist’s mother said her son has taught himself to paint by watching other artists or simply expressing himself. For example, in one painting a stark orange dot stands out against a blue-green backdrop. The artist’s mother said the exhibition has given her son a newfound confidence and that he’s even started purchasing his own art supplies with his earnings. She said she’s hopeful he’ll be able to support himself as an adult one day thanks to his promising paintings. Niam’s exhibit runs until Nov. 10 at the Abbozzo Gallery in downtown Toronto. Niam Jain is seen alongside his mother in this undated image.